International students have the opportunity to apply for positions at KPMG. Find out about eligibility and applications here. 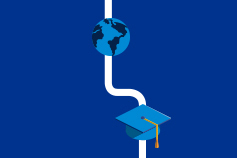 International students have the opportunity to apply for positions at KPMG. At KPMG we firmly believe that a workforce containing a diverse range of backgrounds, skills and experiences helps us to achieve our business objectives. KPMG in Australia accepts international student applications for our Vacation and Graduate Program in Adelaide, Brisbane, Hobart, Launceston, Melbourne, Perth and Sydney who have not yet obtained their Australian permanent residency. This opportunity is not available in our Canberra office due to client requirements. legal right to work in Australia up until such time that permanent residency is granted. You are completing, or have completed, an Australian undergraduate or postgraduate degree that is accredited by the Institute of Chartered Accountants in Australia as satisfying the academic requirements for entry into the Chartered Accountants Program, or other relevant degree. You have studied this degree for at least 2 full years while based in Australia. You will have completed an approved English language test and prove that you have reached ‘Superior English’ by meeting required benchmarks as set by the Department of Immigration and Border Protection. In line with immigration requirements, if you hold a passport from the UK, USA, Canada or the Republic of Ireland you are not required to provide evidence of English language proficiency. KPMG will not sponsor students for the purposes of residency. Successful candidates who are not permanent residents when made an offer of employment will be required, as a condition of their employment, to independently apply for and obtain permanent residency. Information obtained in the process of assessing your eligibility to apply for graduate employment with KPMG will not be used in any way other than determining your suitability to apply for and obtain permanent residency. Only applications from international students that meet the above criteria, and therefore qualify for permanent residence after graduation, will be accepted.